The steps that some of the majors are taking to pacify activist shareholders with a green agenda are long overdue. But when one party consistently takes the moral high ground it is difficult to have a reasoned conversation. Similarly the recruitment of celebrities to the environmentalists’ cause could easily be interpreted as cynical publicity-grabbing, the more so as their lifestyles could hardly be described as modest with their routine use of aircraft. And so there has been a stand-off. Generally, actions speak louder than words, and this is true of what people say about global warming compared with what they actually do about it. Consumers have come to expect budget airlines and now their new handmaiden Airbnb, for example. And so they pacify their consciences with carbon offsets and so on. However, BP’s description of the “constructive discussions” with Climate Action 100+ that will lead it vote to report its carbon emissions in great detail from this year on shows how far things have gone in the past year or so. In a statement February 1, it said it recognised that shareholders, and society more widely, had to have trust in BP if it were to remain an attractive and reliable long-term investment. “And only by remaining a world-class investment can we most effectively play our part in advancing a low carbon future,” it said. The annual general meeting in May could see this proposal adopted, while a rival plan on cutting emissions outright seems intellectually doomed. After all, surely it is better to produce some emissions in one region if that is part of a process that will see far more emissions cut elsewhere in the world, there being only one atmosphere. The same group had a similar success with Shell, long accustomed to dangerous publicity stunts carried out on its rigs. The bad science that led to Brent Spar being dismantled onshore only appeared to vindicate the major’s earlier opposition. Shell aims to reduce its net carbon footprint by around half by 2050 and by around 20% by 2035 as an interim step. This approach covers the total emissions associated with the consumption of the energy products Shell sells, across their full lifecycle. Shell will express this as a Net Carbon Footprint in grams of CO2 equivalent per megajoule consumed. Both companies have built carbon emissions goals into their staff bonuses, which in theory means that producing a new petrochemical product or fuel that emits less when used and/or has a lower carbon input, will lead to tangible gains for the team developing it. If higher pay is one of the carrots, the stick is the threat of legal action, as suits against ExxonMobil in the US have shown. Whoever wins, a lot of management time and money will be spent in fighting in court. And sovereign and other wealth funds are becoming a lot pickier about whom they select as bedfellows, with some classes of stocks in the extractive industries sector being off-limits. This in fact was the topic of a feature in the previous issue. Other energy companies are doing the same, bringing down their average carbon content per kilowatt-hour sold by investing in more solar and wind and batteries. On the other hand, as Shell says, this process has to be collaborative: research and development is costly and demand needs to be certain. Dialogue with the major fuel users, such as airlines, is necessary. This is the positive side of the energy transition, and stands in stark contrast to Germany’s energiewende. It led to billions of consumers’ euros squandered over many years on renewable energy, backed up by lignite and leading to a net increase in greenhouse gases, never mind the deadly emissions of particulate matter. News that the German coal commission has recommended a date of 2038 for the ending of coal consumption is not reassuring. Another 20 years is a long time, especially compared with analogous goals set by other countries. Many details are yet to be decided. But if all such plants are like the still-under-construction Uniper’s Datteln-4, which uses anthracite powder instead of lignite, and can generate useful heat to raise the efficiency, then things might not be so bad. So much for the big producers and the energy transition. Although they face a seismic shift in their practices, as they seek to renew their licence to operate, their existing consumers are less and less interested in their conventional hydrocarbon products with each passing year. Electric cars powered by coal-fired generation are not the answer but renewable energy and green gas are eating away at the margins. Well, if NGW stands for anything, it is pointing up the strengths and weaknesses of policies and company practices in energy, and gas in particular. 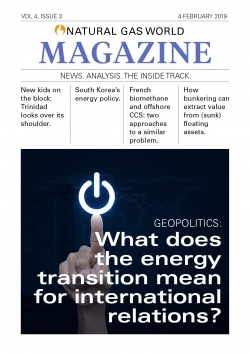 The first three features in this issue look at the geopolitics of the energy transition and at two complementary or competing solutions to the decarbonisation riddle. In the last issue, we drew your kind attention to a monthly free magazine, dedicated to the LNG industry: LNG Condensed is now on line. Now we are pleased to announce another focused publication, Gas Transitions, which will be available soon on our website. We are confident it will prove essential reading for industry and policy makers alike and look forward to welcoming you to that, as well. NGW Magazine Volume 4, Issue 3 is now available to Premium Subscribers.